I’m trying to learn how to use applescript. I made two applescript apps that might be handy to other OS X Tiger users out there. Are you tired of Dashboard eating away your memory or simply don’t need it ? Look no further ! I automated the process for you in 2 simple little apps. One for deactivating and one for activating if you would like it back afterward. There is no hard way because it is just entering a line or two in terminal, but this makes it easier for those who would like to stay out of terminal. You can find them here . If you download them throught the web version of my idisk it doesn’t seem to work. To acces my idisk just go to finder … click “go” … click “idisk” … click “public folder other user” and enter g.plaquet for the username. Look what I bought on ebay ! Tomorrow I can call myself the proud owner of a macintosh classic II. I’ve been looking for one of these first macs for some time now. I found a person through ebay who has been a collector for years and gives me a lot of extras because of the fact that I’m a mac user too, he’s even willing to bring it to my house ! This is another example of how close the apple community is. I contacted him to buy his macintosh SE but eventually chose this one because this one works with the floppy disks we still have today. It is just a pretty computer, certainly considering his age. But enough about that … this makes me think of how the computer industry has exploded these last 30 years. 20 years ago the macintosh was THE “high-end” computer and it was even in B&W ! It is impossible to compare it to what we have nowadays. These are some questions I would appreciate comments on. What do you think of this progress ? Is it too expensive to keep up with ? Where will it end ? Will we some day run out of possibilities and create the ultimate machine ? What does this ultimate machine look like to you ? And finally, what would be a feature (that doesn’t exist yet) that you’d like in your next computer (that’s a hard one huh) ? Thanks for reading. I am posting this from Ike’s Coffee and Tea her in Tucson. I like this American concept of Coffee places providing free internet acces for as long as you want (just buy a drink from time to time, and refills are pretty cheap so). I’ve been here for 3 hours now because I wanted to meet up with another mac user I met on my second day here. While we were talking another mac user came to sit with us and that way I got another contact on this globe of ours. I like the concept because the WIFI is free. In Belgium, you have hotspots, but they are owned by the telecom companies and they charge you money for it. It really made me think about the whole pay for internet concept. I know that the telecom companies put a lot of money in creating the pipes and keeping them up and running, but the internet is no longer a luxury product. Some people have “their entire life on the net” as they say. I find that internet acces should be cheaper so that everybody could afford it, or that there should be free hotspots across the country which are provided by the government and free to use. I’d really like opinions on this because since you are able to read this, you are connected to the internet and confronted with this issue. It does give this underground feeling to it if you start looking for free hotspots (be it in a bar somewhere or from someone’s house), but still I think that things have got to change some way or the other. That’s it for now, thanks for reading. Time some real “Americana”, things you can only see in the states. 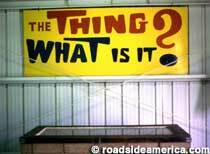 Imagine yourself driving on the interstate and seeing big yellow signs for miles and miles with “THE THING” on it. What is the thing you are asking ? Nobody knows until they pay a dollar to see it. After that you can even buy a Jackalope, and some people seem to fall for it too. What I’m wondering is how the hell they can afford those big signs all the way to Texas. How do they get that money from a buck for every visitor and a few idiots who pay a hundred dollars for a fake animal ? I see the humour in it, that’s for sure, but you sure as hell don’t see anything like it back in Belgium. As you may notice I am not giving away the identy of “the thing” I wouldn’t want those people to run out of business. But underneath here you can see a real Arizona Jackalope. One stuffed and one in the wild … believe it or not. Today I would like to discuss the US/Mexico border here in Arizona, which is probably similar to the ones in other states. About 90 km south of Tucson you’ve got the bordertown of Nogales, which makes me think of Berlin during the cold war with all the barb wire and patrols. There are checks up to 25 miles of the border. The border patrol looks like a little army on it’s own with helicopters, patrol cars, off road vehicles, even armed troops. Why do the Americans fear the Mexicans that much ? I can understand they don’t want a massive flow of people into their country, but aren’t there other ways to prevent that ? I also find the term “alien” a bit discriminating, I would not like being called that way. And what actually bothers me is this : the people who are running for congress are abusing the situation. There’s one of them who has this infomercial on TV that goes like this :” help me keep the aliens out of our country and protect our borders, send me to congress” while he said this, footage of armed soldiers was shown. Is that all that is on his agenda ? Is that the priority ? How about investing more money in preparation for disasters like Catrina ? I just hate how he talked down on the mexicans like they were a pest. I know I can’t really make my opinion on this matter strong because I haven’t been here long enough and I don’t know the background and history. This is just my first impression of how things are going down at the border here in the states. If anyone would like to object to my story, complete it or give us some background on this situation, please feel free to leave a comment. I talked to Dianna about this issue and it did give me some more insight into the matter. I can see now that the Americans have to pay a lot of taxes for these foreigners and that they don’t do anything for their money. I still stand by my opinion though on the use of the word “alien” and the infomercial I saw on TV. What will become of air travel ? Since I have to make my way back to Belgium with all the new security caused by the recent threat at Heathrow Airport, London. I wonder were air travel is going at. Air travel is one of the greatest inventions ever made by mankind. You can be with a friend or relative on the other side of the world in a modest 9 hours. But since 9-11 it looks like the fun isn’t there anymore. I remember that when I flew to Egypt in 1999, we didn’t think about checks and stuff like that, flying was fun and exciting. Nowadays everybody is just hoping none of their belongings are confiscated. Like with the recent threat, suddenly you can’t take any liquids onto the plane. What’s next ? And I would like to quote Mick Aloha from the moon masters on this one :”What if somebody makes a bomb out of a wig ? You want everybody to cut their hair off ?”. He sure has a point there. Terrorism is very lame and is taking the fun out of life. If you don’t feel safe, you can’t enjoy yourself, right ? And I know, when they do discover a real terrorist act, you’re happy they did. But what I am trying to say is, will acts of terrorism keep on limiting our rights and freedom in air travel and life in general ? Is there a solution to al this misery ? And if yes , what is it ? Thanks for reading, comments and opinions are greatly appreciated.